If you have beautiful hard wood floors and want to refinish them yourself or have a professional company help you re-coat them, you will want to know the following information so that you can better understand the process. If the floor has visible dents, wear patterns or permanent cupping, re-coating is not a viable solution, and it will be necessary to fully sand the floor to restore the finish. Royal wood floors can answer any questions that you might have regarding a sanding process. Finish adhesive is affected by surface contaminants, i.e. wax, grease and many other maintenance products. One brand or type of finish may not be compatible with another. Always test in several areas in accordance with finish manufacturer’s recommendations to be sure that the finish will adhere and dry properly. If the floor has been waxed, NWFA (National Wood Flooring Association) guidelines suggest re-waxing the floor whenever possible, rather than re-sanding. There are several methods to test for wax. One is to use a small amount of mineral spirits on a clean white rag in an area that has not been exposed to high traffic. If a slight yellow or brown color appears on the rag, paste wax is probably present. 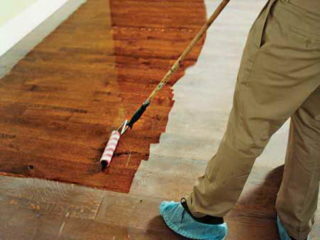 Another method is taking a piece of screen or sand paper and lightly abrading the floor. If residue balls up, it is a paraffin-based product. Yet another test involves putting two drops of water on the floor. If white spots appear after about 10 minutes, the finish is probably wax. Please note that closets may not be the best areas to test because wax, maintenance and other finishes are used on the main body of the floor, but usually not on closets. Understand that testing in one area will not guaranty acceptable performance. Factory-finished floors that contain a high-abrasion finish may need to be pre-treated with an approved chemical etching solution, as recommended by the finish manufacturer. There are two basic re-coat methods: a screen and re-coat and a chemical etching and re-coat system. A screen and re-coat involves lightly abrading the top surface with a screen or a pad and abrasive strip, then applying another top coat. In a chemical etching and re-coat system, the existing surface is chemically etched, then re-coated. No sanding or screening is performed. Screening and re-coating is the practice of adding another top coat of polyurethane to improve appearance of the floor, after abrading it slightly (using a mesh screen) so that the finish adheres better. When using the chemical etching and re-coating system, use a chemical etching solution that has been approved by the finish manufacturer. Clean and pre-treat the floor according to the finish manufacturer’s recommendations. Then lightly abrade the old finish according to the finish manufacturer recommendation. 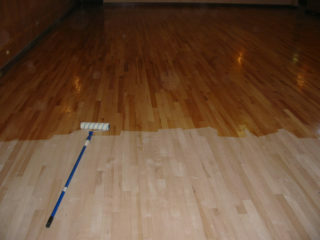 Then vacuum and tack the floor with a proper solvent, dependent on the finish, and then allow it to dry thoroughly. Lastly, apply the surface finish according to the manufacturer’s recommended cover rate using a manufacturer’s recommended applicator and procedure. If you are going to use a chemical etching type system you will want to thoroughly clean and pre-treat the floor and then follow the finish manufacturer’s recommended chemical etching agent and procedure. That includes the applicator recommendations. Most surface finished floors can be walked on after 24-48 hours. Remember not to slide furniture on the floor. Simply lift it into place after 48 hours. Area rugs can be put down after the finish is fully cured, generally after 7-30 days or as recommended by the finish manufacturer. “The best way to make sure that your hard wood floors are protected and as beautiful as they naturally can be, is to always do the research first or seek professional help. Then problems such as the ones described here can be prevented,” says Allman.